A domain name is a specific website address that you choose and register. Every website has a domain name (ex. crimsondesigns.com) which is used to access the website. Whenever you visit a website, the domain name appears in the address bar of the web browser. A domain name is part of a larger Internet address called a "URL." Domain names are easy to register, though they must be renewed every year or so. Anyone can register a domain name. See Choose your Small Business Domain Name like a Pro. Web hosting is a place to store your web pages. Everything you see on the internet is saved on a computer somewhere. You pay a monthly fee to store your pages and have them accessible world wide. We publish your web site design project to your chosen hosting service upon completion of the design. It is a technique web designers use to create flexible web page layouts that change depending on the screen size of the visitor. 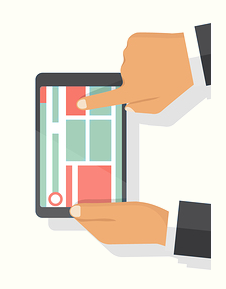 A responsive website is mobile friendly and automatically changes to fit the screen you're reading it on. As the screen gets smaller, the content shifts to the best display for that size. A CMS or content management system (such as WordPress) will give you the ability to change your web content without messing with any code or involving your website designer. With a CMS, you can edit your website by going into your admin section in a web browser, opening up a web page, making changes in a WYSIWYG editor and publishing it. The edits are sent to the database and will instantly appear on your website. With a CMS, you can make your content changes from any computer. A CMS also allows you to work on a page in "draft" mode and publish whenever you're ready. A CMS also provides multiple user accounts and various levels of access rights. However, it is important to know that a website built on a CMS is not maintenance free. CMS sites need to be upgraded from time to time. Also, keep in mind that anyone who will be using the CMS must be trained on its use. If content is not updated regularly, editors may forget how to go about making changes. Search Engine Optimization means designing web pages in ways that ensures that they are accessible to search engines and improves their chances of being found in search engine result pages. It is a combination of on-site and off-site tactics all working together to create a high authority website. On Site SEO includes everything from the words that appear on your website to the source code that goes into your site's HTML. This also includes such things as adding the right amount of keywords and internal links, optimizing images with ALT tags, and making the website appealing to readers. Off Site SEO focuses on a site's relationship with other websites and is all about link building. The more links a site has, the more popular it becomes. The amount and quality of links directed to a website, is one of the ways that Google sorts their search engine results. Your web designer should be familiar with Search Engine Optimization. Be sure to ask about their knowledge of it before you hire someone. Is it time to redesign my business website? We have created a business owner checklist to help you decide if it is time to redesign your website: 8 Simple Ways to Tell if your Website is Old: Business Owner Checklist. How do I know if I need to hire a web designer? If you answered "YES" to these questions, you will likely need the assistance of a web designer. We can help. See our web design services. How do I choose the right web designer for my company? You need to find the "right choice" for your personality, business, location and circumstances. Here are 10 questions to keep in mind as you compare potential candidates. See How to Choose a Web Designer. What are the basic steps to your web design process? After learning about your business, we will put together an estimate for your custom website design. Once the estimate is accepted, a $200 deposit is required. We will then construct two website home page drafts for you to consider. Next, we will combine your drafts into one page, based on your preferences. After that, we will work with you to fine tune your web copy as we design the rest of your site. We will guarantee that the website we design for you will work in the latest browser versions of Google Chrome, Internet Explorer and FireFox on a pc, and Safari and Firefox on a mac. It will also be unique. We do not use templates. A web design deposit will be sent to Crimson Designs before work begins. Then one or two more payments will be expected, depending on the size of the project. We rely on timely payments from our clients. Please keep in mind that once your deposit has been received, your project is accepted in good faith and other projects are often turned away. If you change your mind for any reason and choose not to complete your project, your deposit is nonrefundable. We also reserve the right to remove any web design project from viewing on the Internet until final payment is made. We will do our best to set milestones for completion of your website, but it depends on your participation. If you are prompt in sending information and respond quickly to our questions, your web site may be completed in several weeks. Some web sites, on the other hand, take several months to launch. It depends a lot on you! Who owns my website after it is created? Your new web site is yours - you own it 100%. Crimson Designs reserves the right to display any development examples (web design, banner, logo or other) in our online portfolio. We also request that the links to Crimson Designs on your site will remain until the design is no longer active on the Internet. How do I make changes to my website later on? 1) Ask your web designer to make the changes. We offer website maintenance at an hourly rate of $30. We also offer a monthly service plan. 2) Use a web editor such as Dreamweaver to access your website. Adobe Dreamweaver is a site building tool that allows you to create and edit web pages and applications using a graphical interface and built-in advanced design and coding features. Dreamweaver takes some time and effort to learn. 3) Utilize CPanel to make changes. CPanel is a website management system, included with many hosting plans. CPanel provides a range of tools, one of which is the File Manager. The File Manager allows you to create or upload new files, and edit them using either a WYSIWYG editor or hand-coding the HTML. 4) Include a CMS in your website. More Questions? Contact Crimson Designs. See our Small Business Web Design Services. See our NH Web Design Portfolio.